A write-in activity book to help children plan, plot and write their own adventure stories. Each colourful page is full of inspiring ideas for writing thrilling adventure stories about explorers, spies, daring rescues, ghosts, aliens, heroes and villains and lots more. Fun activities such as creating a character and “what happens next?” help children to create characters, develop plot and stage all important action scenes, until they are racing through their own short stories. Budding authors who fancy writing an adventure story will love this. Full of ideas and tips on story planning, character, action and dialogue, there’s also space to write your own story. 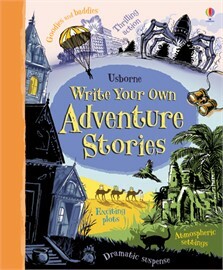 A fantastic write-in book for children to pen their own adventure story. With hints and tips on how to create characters, plan plots, write dialogue and stage action scenes. A fantastically presented story-dreamer's bible, a completely essential purchase for you and your kids if you're starting out writing your own stories. Kids who enjoy writing will find lots of practical and inspiring ideas in this excellent book, while those whose hearts sink at being asked to write a story will see just how much fun it can be.